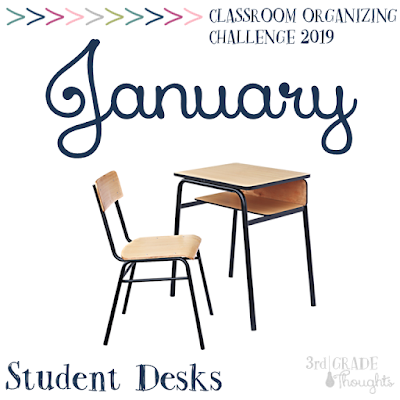 Welcome to the first month of my Classroom Organizing Challenge! I can't wait to dig in each month this year to a specific part of our classroom to get rid of clutter, organize, streamline, and make our classrooms more stress-free! Below are the list of topics and months, so you can join in and/or catch up anytime. 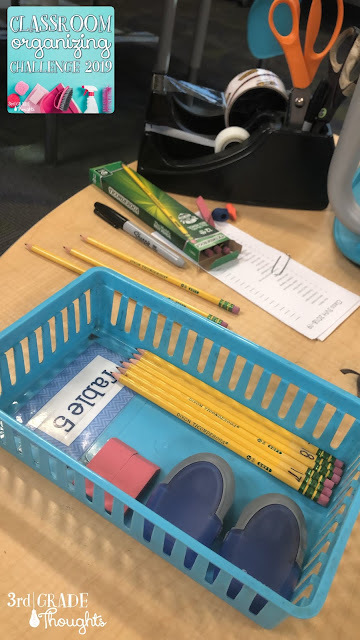 While I don't have student desks in my class, I wanted to think of this first challenge as the area where students spend most of their work time and the spaces where they keep most of their supplies. For some, that may be desks, and for others it may be tables, bins, cubbies, etc. We'll be flexible as we go through these challenges since all of our classrooms are so different! I want to start with this challenge since it involves the students and can therefore get us motivated to tackle the rest of these challenges this year. With 25+ pairs of hands to help, this one should not take too long and can make a *huge* impact from the get-go in your room. Some of these items you can co-create a plan for with your students, others are teacher's choice! We're starting off this challenge with two simple ideas: ways to organize your students and figuring out how to manage their pencils. I want to start small, but with projects that will have a huge impact. 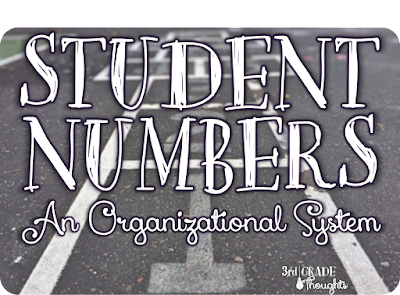 Organizing your students (by number, for example) is something that will continue to show up throughout our challenge. And, if you're like me, there is nothing worse than pencils all over the floor, students who are using pencils that are 2 cm long, students who can never find their pencil, etc. etc. etc. Let's tackle both of these systems early on to get us off on the right foot! First, do you use student numbers with your class? This has been one of the best organizing tips for me throughout the school year and you don't need to wait to implement these at the beginning of the school year, you can do it now! I organize students by last name and assign them a number that they use for the remainder of the year. Any new students receive a number at the end of the list and any numbers of students who leave are not used for the rest of the year. So it may require some flexibility, but once a child has a number, it's the only one they will need until the end of the year. Find more information on student numbers HERE. If you have a high-turnover school and/or numbers just aren't your thing, no worries! There are other ways you can organize your students (by first name, last name, etc. ), but I recommend some system since it will help set the foundation for other systems in your classroom. Once you have each student assigned to a number, or a system of your choice, have them practice, practice, practice! One of the first places these numbers show up on a daily basis is on the material they use the most: their pencil(s). 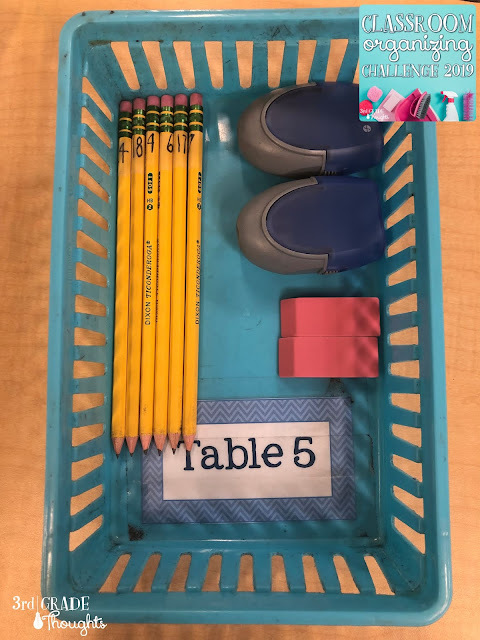 Because we have tables, having their number on their pencil is critical and also helps me when it comes to keeping organized. 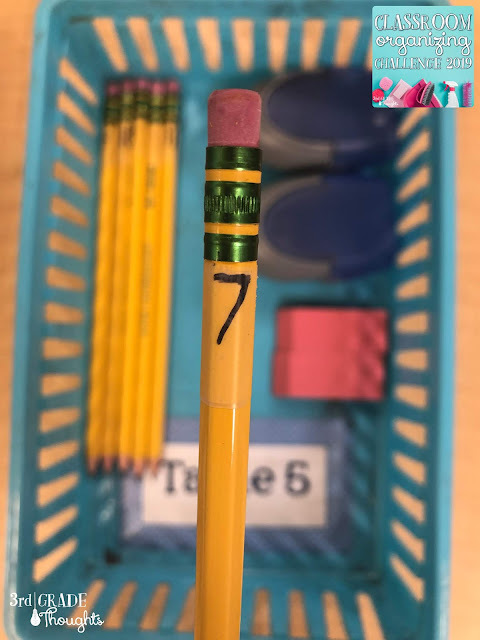 On the top of each pencil is the student's number in Sharpie and a piece of Scotch tape wrapped around to protect the number. On the bottom of each bin, I have a label for their table number, since these sometimes get shuffled around during projects. 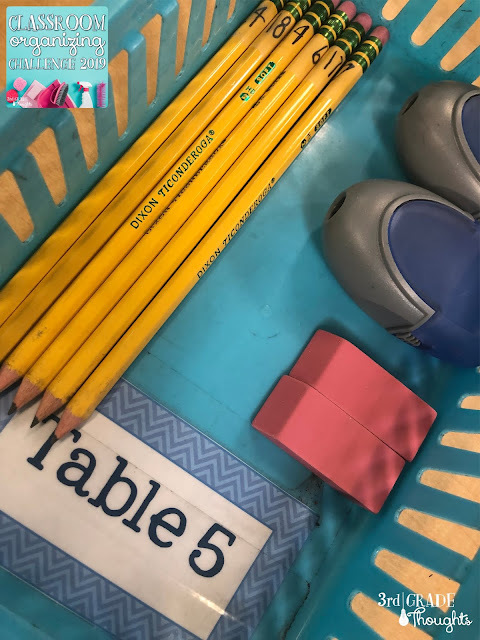 Teacher Tip: For a great incentive that your class can participate in as you get used to this system, be sure to check out the Great Pencil Challenge by Ladybug's Teacher Files. This was a lifesaver to me when I started this system years ago! Now that this has been my system for several years, when students need a new pencil, they have to turn in their old one to me so I can try to limit the microscopic pencil nubs that arise. I also hold pencil checks sporadically throughout the month and check to see if their pencil is in need of replacing. After the long winter break, I will just replace them all and start from scratch; New year, new pencil. Students are also responsible for wiping down their pencils when they wipe down their desk to try and stave off any germs especially during the cold and flu season. How do you manage pencils in your classroom? Do you find yourself going through hundreds of them a month only to find most of them on the floor at the end of the day? Or do you have a system that works that you love? Would a student number system work for me? Is there another system that would work better? Can the students memorize these or will it be for my own record-keeping? How will I incorporate new students into the system? How are pencils managed in the class? Could I move from individual supplies to group supplies for just pencils, to start? How will I incentivize this new system for my students? When will I check-in with students about their pencils? What will students do when they need a new pencil, if they lose a pencil, or if they find someone else's pencil? How can I keep these materials organized in shared spaces, like tables or stations? Join me next week when I dive into more of January's challenge! This is nice everything is well organised. I picked up a toothbrush holder at the Dollar Store for each student (2/$1. They hold 5 pencils and I have a student sharpen/stock everyone's "pencil tube" on Fridays. We have not had a single instance of students not having a pencil to get started with their work!! What a great idea! I love that they hold five pencils so everyone has some back-ups throughout the week. Thank you so much for sharing! !